How Does This Deck Even Work? The main strategy of this deck is to constantly stream Red Card + Delinquent by looping them with Oranguru’s Resource Management and Zoroark-GX’s Trade. At first glance, it may not be apparent how this deck is even capable of winning a game. Obviously, you disrupt your opponent with your multiple disruption cards, but what do you do then? Even if you get hit with Red Card + Delinquent, you still get to keep 1 card which is enough to keep playing the game right? Well, not exactly. We can see why this deck is so powerful by imagining ourselves as the opponent who is getting constantly Red Card + Delinquented. For this example, let’s pretend we are playing Buzzwole/ Lycanroc. Assuming we hit a Draw Supporter off of every Red Card our opponent plays, we obviously keep that as our one card. So we play our Professor Sycamore/ Colress to draw cards, attach an energy, maybe play down a basic, and Jet Punch. With this, we have lost the 3 cards from the Delinquent, the 1 supporter that we played, and 2-3 cards we played after the supporter. That is about 6 cards being milled from the deck. When we do this repeatedly, our opponents begin to lose crucial resources to smoothly play the game, causing them to over extend to progress their own game and eventually decking themselves out. Think back to the games you’ve played, and think about how easy it is to start running low on cards in deck when neither player is even disrupting board state or milling from your hand. Decks without an internal draw engine just eventually whiff the draw Supporter, or necessarily have to play themselves to 3 or less cards. Once this happens, you take your opponent to 0 cards in hand and take control of the game. With enough practice with this deck, you can actually begin playing around the possible potential plays your opponent can make by considering the amount of cards they will necessarily have to play in order to pull it off. Once you get this down, you’ll be able to much more easily manage your resources and build the perfect hand to execute your opponent. Once your opponent hits 9 cards in deck and hand combined, you win the game with Delinquent + Red Card + Trick Shovel + Dowsing Machine for Trick Shovel. 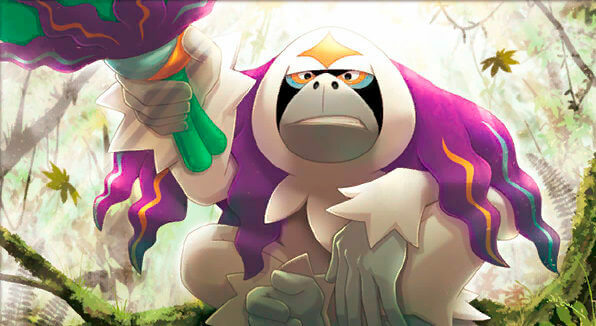 Oranguru is the main attacker of the deck. He allows us to consistently get back the resources we need in order to keep our opponent under lock. We essentially want to rush him into the active position and constantly stream his attack which is why we play 2 Oranguru. Generally, our Resource Management should be something like VS Seeker/ Dowsing Machine/Stadium or Energy. Of course, depending on the situation and match up you can call an audible. Naturally, since Oranguru is the main attacker of the deck, any other deck that tries to mill you or disrupt your board state is essentially an auto win, which is one of the reasons I like the deck so much. This Zorua is by far the best Zorua especially given the nature of the deck. I often find myself just going for the T1 Paralyzing Gaze just because I need to attach to my active Zorua on my first turn in order to retreat it into Oranguru on my 2nd turn. Worst case scenario, I lose the Zorua and the energy that I just put back in my deck with a Resource Management, and, best case scenario, I buy myself an extra turn with a well placed Paralysis. Paralyzing Gaze is definitely the play. 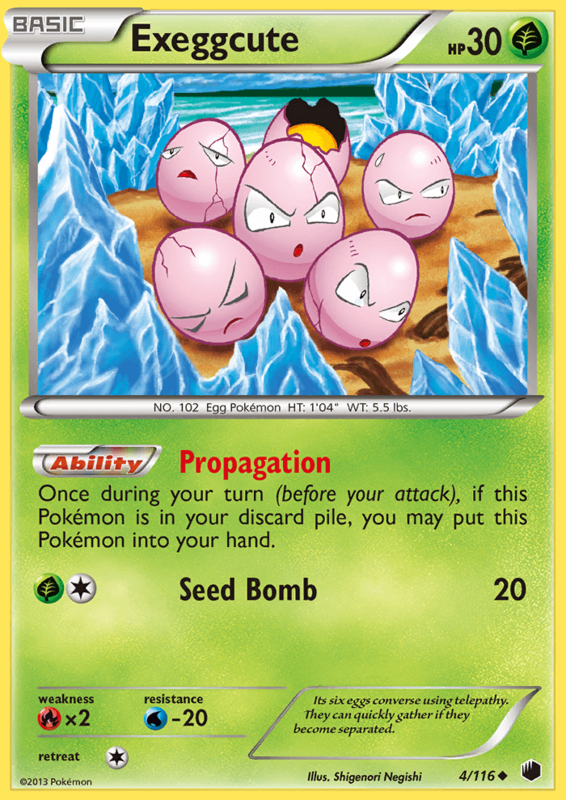 Exeggcute brings a tremendous amount of power and reliability to the deck. Before, we often had trouble establishing a powerful Oranguru loop on our opponent since we continuously had to trade away our hand resources to access the resources we put back with Resource Management. 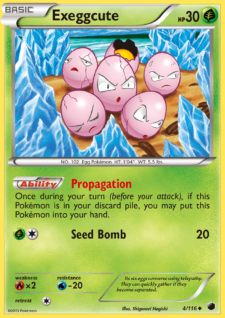 Now, we got access to those cards for free since we simply trade the Exeggcute over and over. In addition, our early game is made so much easier with free Ultra Balls/ Pokémon Communication. Going into the mid/ late game, we gain so much board control by being able to constantly stream Plumerias with no cost. 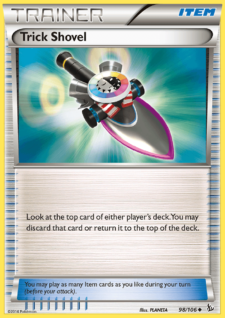 This card is mainly included in the deck for the Zoroark-GX/ Garbodor/ Exeggcute matchup. If you get him down early with Brigette, it can really slow down their early explosiveness. This will give you enough time to establish your board and start disrupting yours. He also makes it to where opposing Zoroark-GXs cannot OHKO your Oranguru which provides an immense amount of pressure on the opposing Zoroark player. Consequently, Sudowoodo is often quickly targeted down and killed, but that is totally fine because all we need to do is to disposition our opponents in a way that forces them to dig and play cards. Sudowoodo does a great job at that. Seismitoad-EX is such a great addition to the power of this deck. When/if you are able to pull off the Red Card + Delinquent + Seismitoad-EX’s Quaking Punch combo, you generally just win the game right there. Very few decks in Expanded can deal with such a powerful combo. Other than that, he can be a great wall for a few turns while you establish your board state. In the ZoroGarbEggs matchup, if you Quaking Punch with a Sudowoodo in play, it is impossible for your opponent to OHKO your Seismitoad-EX without playing Pokémon Ranger. After you win Game 1 against said opposing ZoroGarbEggs player with such a combo, you can actually just lock them out of the game by Guzmaing up one of their Exeggcutes, play a Parallel City with the red side facing you, and Quaking Punch the egg for 0 damage – because of its water resistance—until time is called and take your 1-0 victory. During Portland, I actually pulled this off Round 2 against a ZoroGarbEggs. Seismitoad-EX can also close up certain games given your knowledge of your opponent’s hand and deck. Say you are playing against a Night March deck and they have 4 Double Colorless Energy in the discard, but they also have a Special Charge and Dowsing Machine left in their deck or hand. Instead of stressing about how you’re going to deal with that, you can just Quaking Punch repeatedly until they deck out or you take 6 prize cards, since they have no way to access their energy. This is one of my favorite cards of all time. Articuno-GX is sort of an emergency solution to a board state that is starting to get out of hand. I have had opponents intelligently attempt to stack multiple energy on a Buzzwole-GX or something similar in order to sweep me with a single attacker. Articuno-GX allows you to hard counter this strategy with Cold Crush GX that removes all energy from both active Pokémon. His ability Legendary Ascent plays so well in the deck as it makes it very easy to get him into the active position. Often, you will already have the water energy in play on the Oranguru using Resource Management. If this is the case, you simply need to bench the Articuno to have it capable of using Cold Crush GX and taking the game back into your control. Since the main tactic of this deck is to repeatedly Delinquent our opponent, playing multiple Stadiums is extremely important. Overall, especially in our current Expanded Format, Parallel City is just the most powerful and controlling stadium. Eventually, we can just play down Parallel City enough times that our opponent is locked at 3 benched Pokémon. They can only play counter stadiums and Field Blower so many times, while you can play Parallel City infinitely times with Oranguru’s Resource Management. Parallel City also provides you the ability to constantly clear your own bench of unnecessary Pokémon. This means you can do things like Parallel City away your 2 benched Tapu Lele-GX, open up the bench space with a Delinquent, and then find the Delinquent again the following turn by using Tapu Lele-GX again. This can happen infinitely as long as you Resource Management correctly. Silent Lab is included in the deck as a counter for specific matchups. It is mainly in the deck to stop Rotom decks, to stop Keldeo-EX from using Rush In, and to stop opposing Zoroark decks from using their own propagation to buffer their hand for Delinquent. It may seem counterintuitive to play Silent Lab in a deck that has such a need for basic Pokémon’s abilities like Tapu Lele-GX and Exeggcute, but if you use it correctly in combination with Delinquent and Field Blower, you’ll find that it has no effect on your own gameplay. These are the main draw cards for the deck. You don’t need a high count of draw supporters due to the draw power of Zoroark-GX, but you will need them initially to find the Zoroark-GXs. The most consistent and commonly used draw supporter will be Professor Sycamore because you do not mind discarding resources in this deck. Colress is especially powerful in some matchups just because it can immediately give you huge hand sizes. Mallow is really nice because in certain matchups, you can pick out the tech cards you need like Silent Lab or Weakness Policy. N is just a consistent shuffle draw six cards for you since you don’t often take prize cards. It doubles as a way to disrupt your opponent when they begin to run away with the game. An N to 1 or 2 can be extremely powerful when followed up by a Delinquent to 0. This can often win you a game that you likely should not have won. In total, this deck plays 17 1 of copies of a card not including the Gladion itself. It then becomes obvious why Gladion is so valuable in the deck. I feel like I play this card almost every single game. It can also be extremely nice to find a specific card you need in a scenario that you know is in your prize cards. Against Trevenant decks, I very often played Gladion for a Double Colorless Energy that I would otherwise had to take a chance at finding with a draw Supporter. DO NOT CUT THIS CARD. 2 VS Seeker may seem like a very low count, but it actually works extremely well in this deck. We actually do not have as much need for the card as other decks do, because, in theory, we could just put back the supporter we need with Resource Management. VS Seeker does two things really, to add value to our deck. It, firstly, allows us to have an option on the supporter that we get with it. This is so that we can make a better decision on our turn. Maybe we decide that using Plumeria is actually more optimal than a Delinquent on a specific turn. Having VS Seeker allows us to make that decision. Secondly, VS Seeker allows us to extend combos to multiple turns. Say we analyzed the board state and determined that we actually should 2 shot their Pokémon with Riotous Beating instead of Resource Managing twice, because it will overall net us more cards. Playing 2 VS Seeker allows us to make this play while still having access to our supporters. Battle Compressor adds a ridiculous amount of consistency to the ZoroControl deck. The first Battle Compressor allows you to get both of your Exeggcutes in the discard for free Trades and Ultra Balls as well as discard a Delinquent or Plumeria so you can retrieve it with VS Seeker. The 2nd Battle Compressor allows you to easily ditch all of the cards that you know you won’t need for the matchup so you can blow through your deck and find the resources you actually need. Field Blower is actually one of the most powerful cards in the deck because you can just eventually completely run your opponent out of tools such as Float Stone. Once this is achieved, you can just Counter Catcher or Guzma something into the active position and it is stuck there. You also have complete control in the Stadium war between your own 3 Stadiums, 2 Delinquents, and 2 Field Blower. Every time you see your opponent put down a tool that could help them, immediately Field Blower it away. We play a single Float Stone for the sole purpose of having a pivot in the late game. This way, when an Oranguru is KOed, we can easily find another one and retreat into it to continue our Resource Management. Trick Shovel is an extremely powerful card to just lock your opponent out of the game. Once you get your opponent to 0 cards in hand, you can just control their top decks with Trick Shovel, Dowsing Machine for Trick Shovel over and over and over. You can also just play this card randomly to take your opponent 1 card closer to decking out. It also now allows you to win the game once your opponent hits 9 cards in hand + deck with a Delinquent, Red Card, Trick Shovel, Dowsing Machine for Trick Shovel. Weakness Policy is specifically in the deck to swing the Buzzwole matchup. If you are playing against a Buzzwole deck, then just attach the Weakness Policy to your Oranguru and he becomes a tank. With no damage modifiers, a Buzzwole is 4 shotting your Oranguru, and even with max damage modifiers, the best they can do it 2 shot your Oranguru. This gives you the time you need to lock down the matchup with repeated Plumerias. Dowsing Machine is definitely the best Ace Spec for our ZoroControl deck. It allows us to make perfect decisions when given a board state as well as extend certain combos such as double Trick Shovel. It can often be the vital piece needed for the Red Card+ Stadium + Delinquent combo. Amazing addition to the deck. The single water energy is obviously included in the deck so that we can actually use Articuno-GX’s Cold Crush GX, but it provides so much more to the deck than just that. It gives us a basic energy to attach to our Oranguru. In Control mirror matches, an Oranguru with a basic energy is basically invincible, and is the key to winning Oranguru wars. If your opponent must Plumeria you to stop you from using Resource Management, while all you need to do is Enhanced Hammer, then you are at a strong advantage. Even though we no longer have Red Card + Delinquent, I believe ZoroControl is still an extremely powerful deck especially with the inclusion of Lost Thunder. We can use Mt. Coronet and Metal Energies to act as a weaker Exeggcute for streaming Plumerias and Trade. We now have Custom Catcher which is extremely strong at dispositioning our opponents Pokémon as well as doubling as a consistency card. We also have Professor Elm’s Lecture that acts as a pseudo Brigette for amazing t1 consistency. The new Shuckle-GX allows us to poison our opponent’s active and then retreat into our Oranguru to both control the board and take KOs simultaneously. We can just keep doing this over and over until we win the game in many matchups. Girafarig’s Get Lost attack single handedly wins multiple matchups. Against matchups like Metal and Malamar, we can literally Get Lost away every single energy they play into the Lost Zone from their discard pile as well as Lost Zone any attackers a Marshadow-GX may be using. It also provides so much value in niche situations where our opponent has some crucial resource in the discard pile e.g. 2 Trashalanche Garbodor they were planning to Rescue Stretcher back in. Overall, this deck seems to be very powerful going into the new format, and, if you haven’t yet, you should definitely give it a try. The list above isn’t as thoroughly tested as I would like it to be, but so far it has shown a lot of potential. Well, that is all I have for you guys today! Thank you so much for reading through this article, and I hope you’re able to take away something from this article to better your personal gameplay and testing. Reflecting on my recent finish in Portland, I am very happy with my own gameplay as well as my deck. It’s really nice to come up with a fairly unknown concept, put a lot of testing into it, and perform well. I hope that I can continue to see success with my own creations as well as bring success to others. My next event is Brazil IC, and even though I am just now getting into the testing grind for that event, I am very excited to see what I can do as well as see what the Pokémon community can come up with. Until next time, good luck at Brazil Internationals and good luck at any future tournaments you may attend.